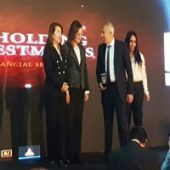 Cairo November 27th 2017, Forbes middle east has awarded the top 50 listed companies traded in the Egyptian stock exchange, as well as the top 25 startups and top 25 women among the awarded companies was NAEEM Holding. CEO Youssef EL Far has received the award. Egypt top 50 companies have a combined market value of USD 30Bn, assets worth USD 90Bn, total revenues of USD 19Bn and net profits equivalent to USD 2Bn.